Superfarmers, HeroCraft’s latest game for the mobile devices has just released on Google Play Store. As the name says “superfarmers’, in the game, you work as a super farmer and fulfill superheroes orders and expand the farming empire overseas. 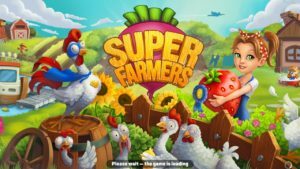 Let’s take a look at Superfarmers game overview, cheats, tips, and guide. In this superfarmers guide, we will cover almost everything; the process of farming you have to follow, all types of factories, plants, trading, superheroes, super farmers, and much more in detail. The very first step you have to do is sowing seeds, because, the raw material is necessary to make more items. For instance, to make bread, we need wheat. To make biscuits we need wheat and eggs. Just tap on the bed/yard and sow your seeds. Just drag and drop a particular crop you want. You can unlock more items; sugarcane, carrot, corn, and many more by leveling up your profile. Keep an eye on your crops and harvest instantly without wasting time. After harvesting, use them to fulfill orders, to make new items. You can keep track of your orders under the order section of the superfarmers game. If your order is ready, just tap on the bus icon and send it to your customers. For each order, you will be rewarded with coins and EXP. At the beginning of the superfarmers game, most of the features are locked and you are restricted to have more factories and items on your farm. To unlock new buildings, features, and add more factories, the bed to your farm, you should level-up your profile. You need EXP to level-up your profile and it can be obtained by completing orders, trading, building new items. Barn aka warehouse is the place where your items; raw material, secondary items are stored. Your barn has limited storage capacity and you should upgrade it in order to store a decent number of items. If you are ignoring this, then you might face difficulty in completing the orders. To upgrade it, you need material and it can be obtained by trading. Head to the boat station, load your items and send the boat. Once you have enough material, go to your barn -> enlarge -> confirm. You can also increase its capacity by watching a video ad. It is not an idle farming game, so you have to manually take care of all things. Focus on your orders and follow the process to make the items as fast as you can. 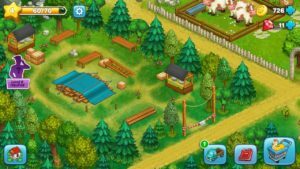 You can easily do it if you are paying attention to all the factories, animal shed, bed, and barn. There are a fixed number of slots and you are restricted to produce endlessly. Go to your factory and you can see the number of slots. You should add more slots to increase the production rate of items and you will be able to complete the orders. Watch a video ad and add one more slot to it. 4.) 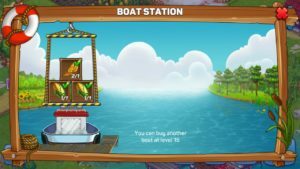 How to level up fast in Superfarmers game? If you see a balloon or chest on your screen, grab it. It might contain crystals or other useful items. For this, you have to watch a video ad. You have limited land for the farming, you should buy more to expand your farming business. Just tap on that area, watch a video ad and farm on!